The Arctic has astounding ice. 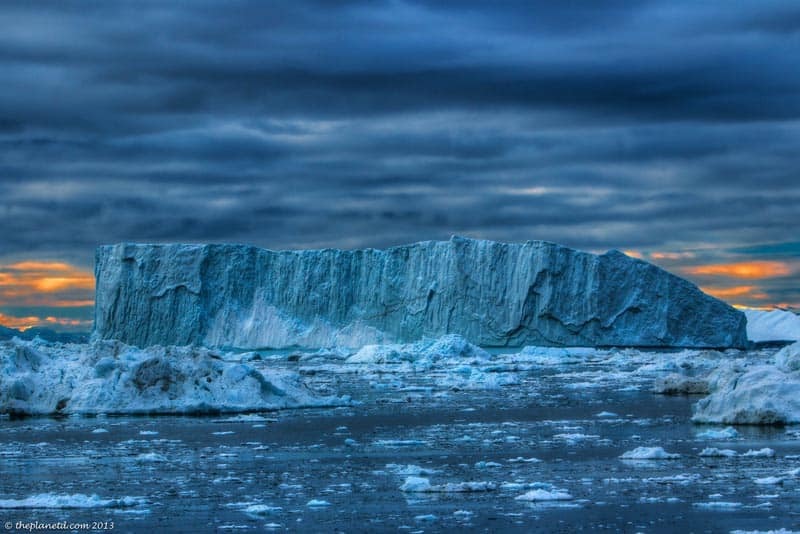 We didn't quite know what to expect when heading to Greenland, but when we saw uncharted bays and giant Fjords filled with massive icebergs, we were astonished by their beauty and magnitude. 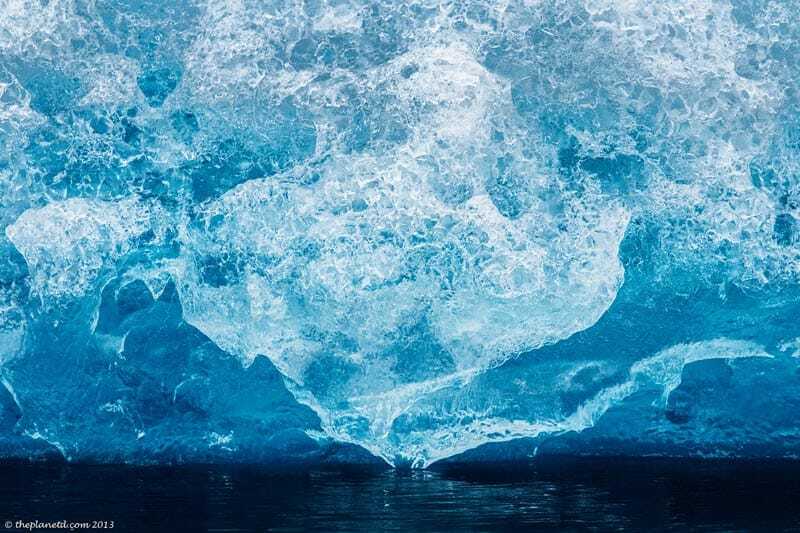 Once we learned more about Arctic ice, we came to realize that we shouldn't have been surprised. 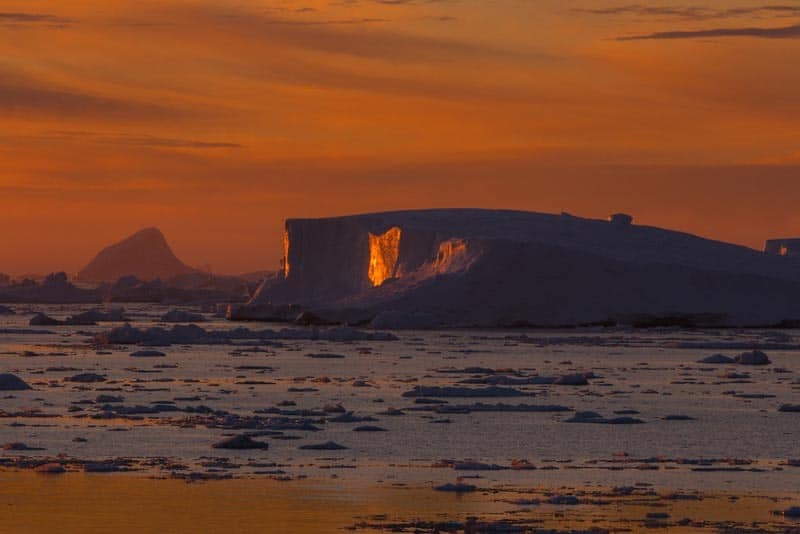 In the northern village of Ilulissat, you'll find the Ilulissate Icefjord; home to the most active calving glacier on earth. Immense chunks of ice break off the glacier and sit in the bay working their way through until their final release to the sea. Icebergs the size of islands float through the waterways making their way to the Atlantic Ocean. Once we saw the scale and scope of the ice, we understood how the Titanic was taken down so easily a century ago. Ladies and Gentlemen I give you…..
We thought the ice in Antarctica was astounding, but then we visited the Arctic. It was always worth it to get up for sunrise. 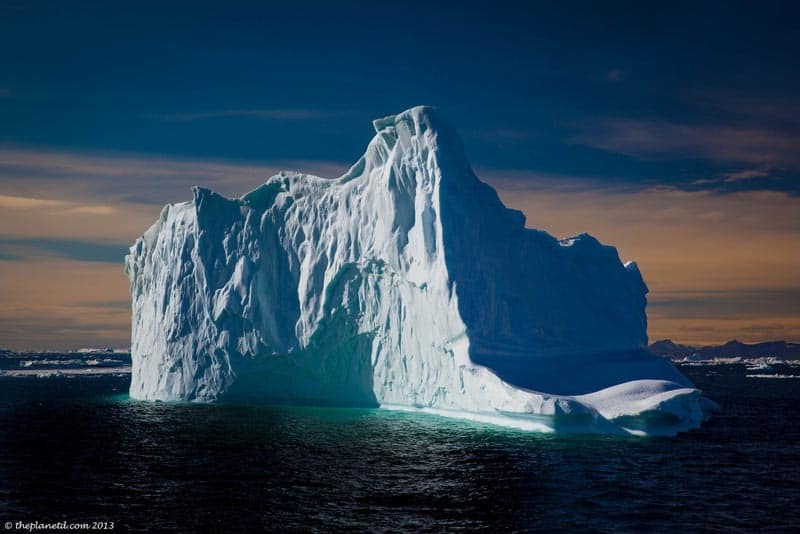 The immense size of icebergs surprised us. They were the size of apartment buildings. 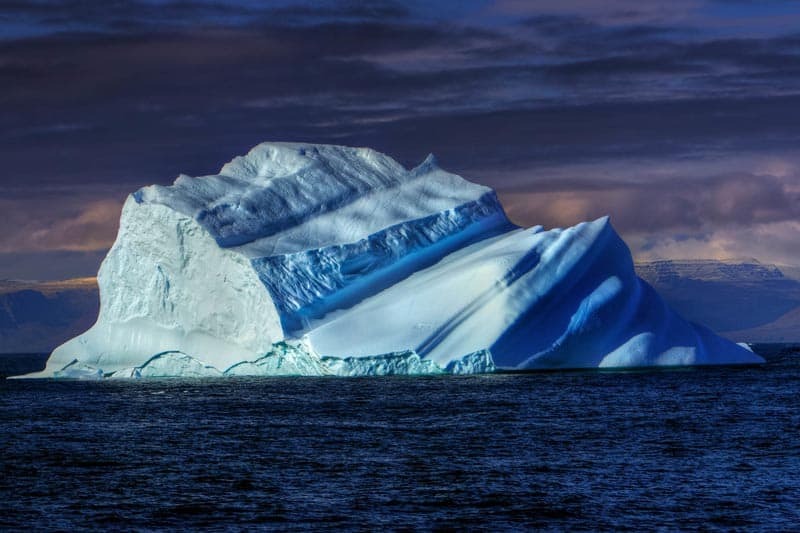 When an iceberg is a deep blue like this one, it means it's recently rolled over. 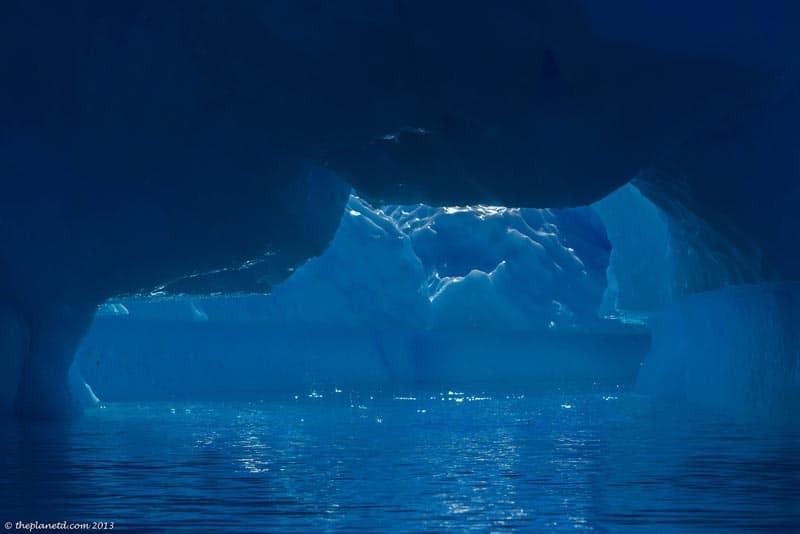 90% of an iceberg is underwater. 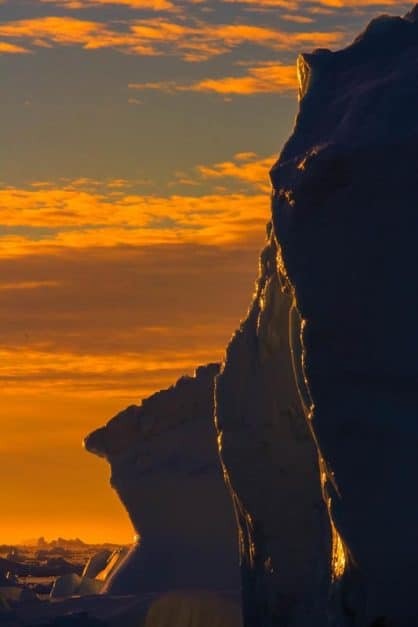 When Kayaking in the Arctic we had to keep our distance, at least stay 3 times the height of the iceberg. There is always a danger it will roll. 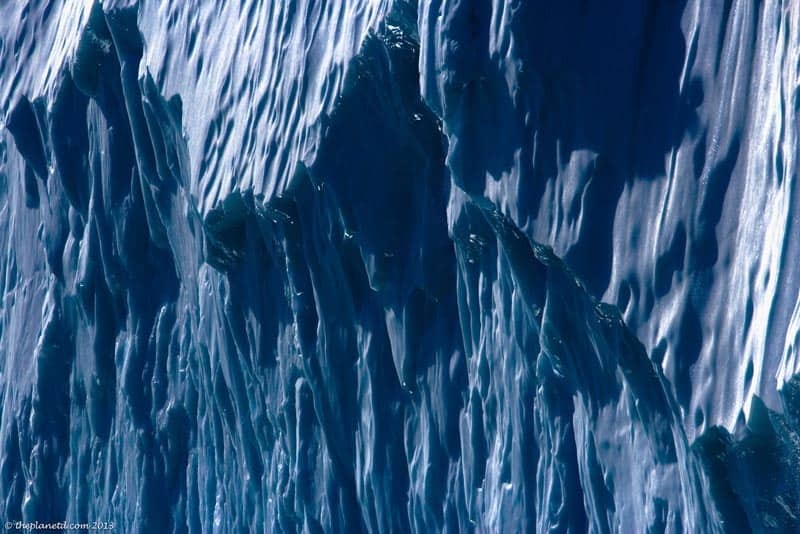 Captain Peter of Quark Expeditions had to navigate through treacherous ice fields on a daily basis. We were out in the middle of nowhere, yet we saw fishermen on the sea. 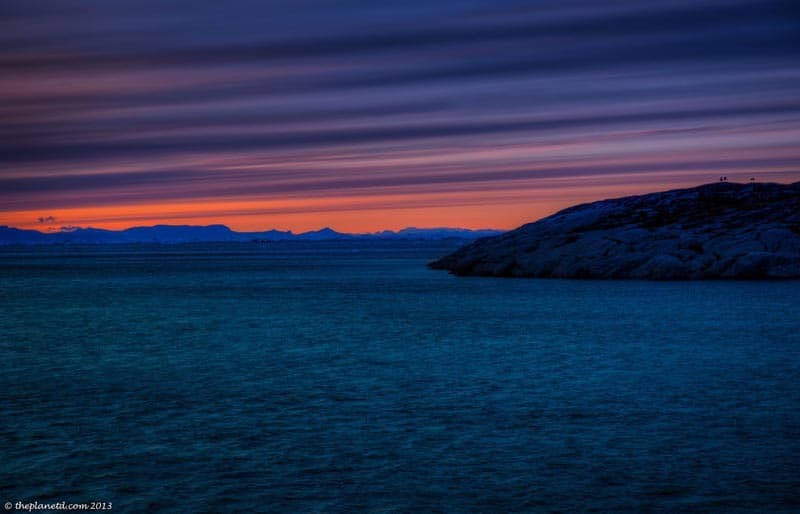 The culture of Greenland is strong and resilient. 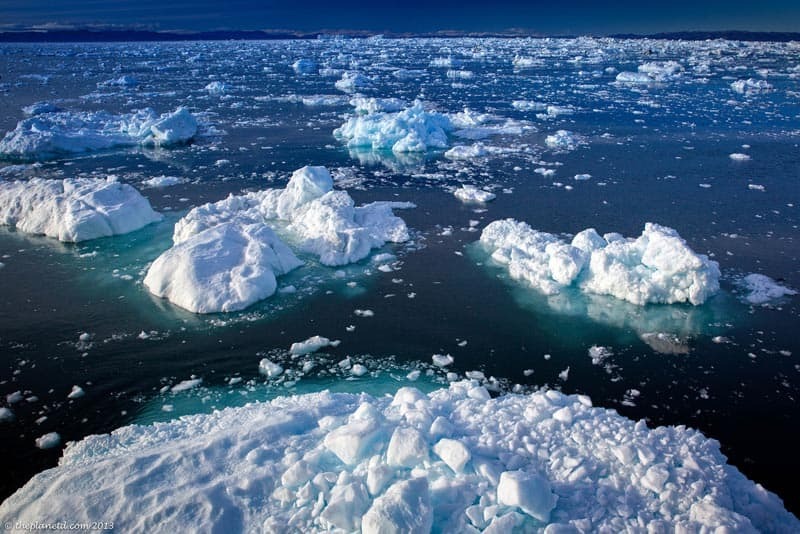 Arctic ice can float as far as New York before finally melting away. Sometimes we sailed so close to icebergs we could nearly reach out and touch them. 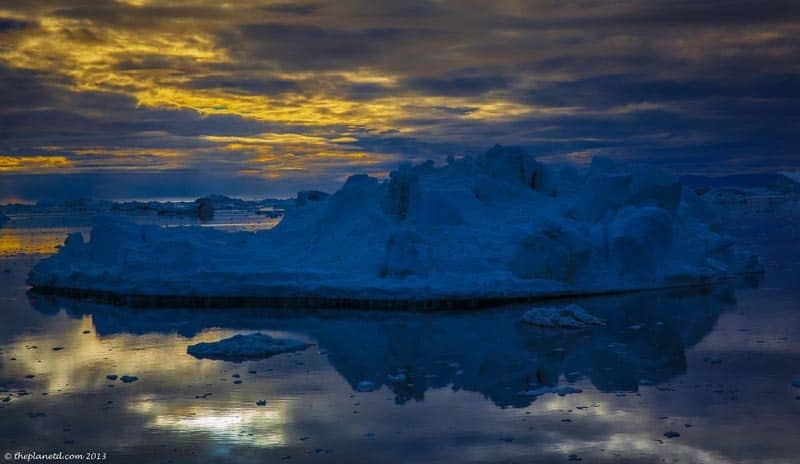 Disko Bay was our first stop where we truly saw Arctic Ice. Most times of the year it is impossible to pass, but we were lucky with a skilled captain and enough space to navigate. It was truly a treat to witness the beauty of Arctic Ice. It's tempting to kayak right under an arch, but don't do it! 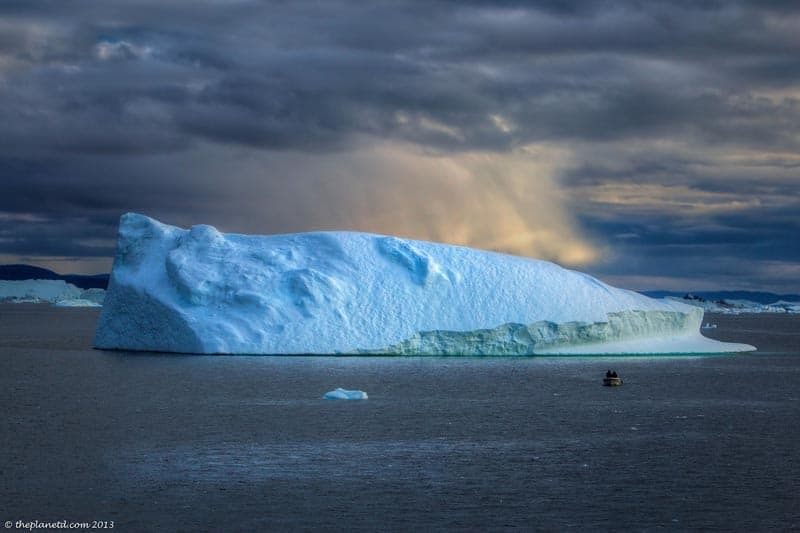 It's extremely dangerous to go near any floating iceberg. We spent a day sailing as deep as we could into a channel. When the ice got too thick, we simply turned around. 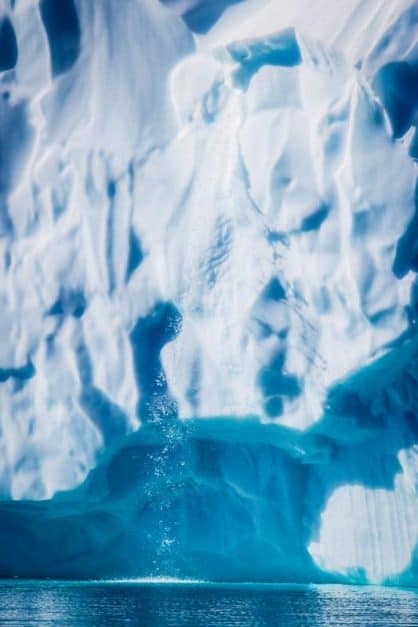 Out on a zodiac tour, we saw a waterfall coming off a giant iceberg. These are so large in mass, it's like looking at a frozen island in the sea. 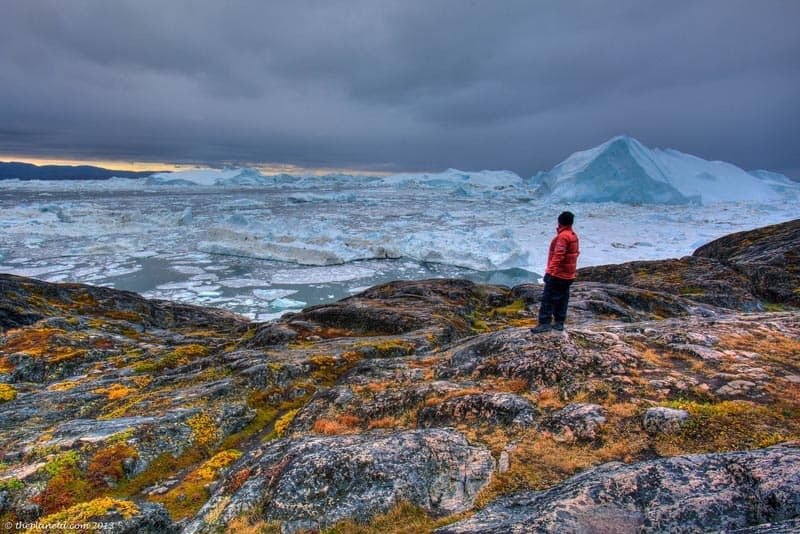 Dave looks out at Ilulissat Icefjord from the Arctic Tundra. 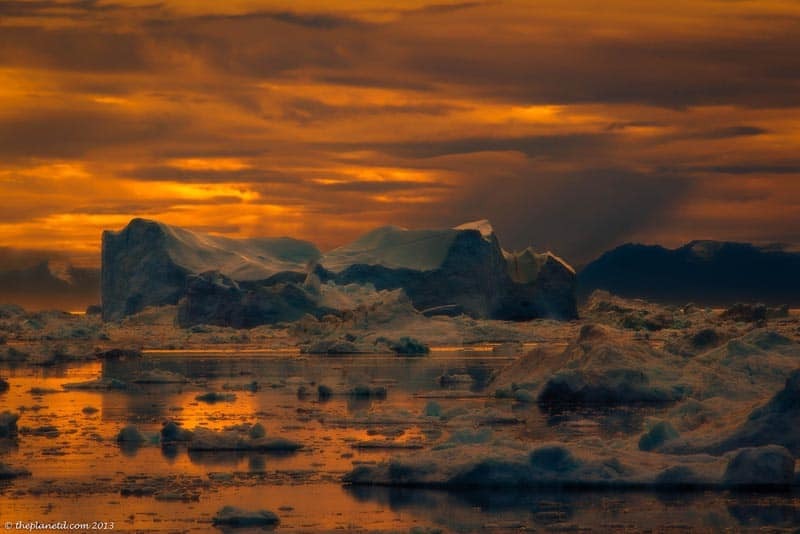 This is where icebergs are born at the world's most active glacier. 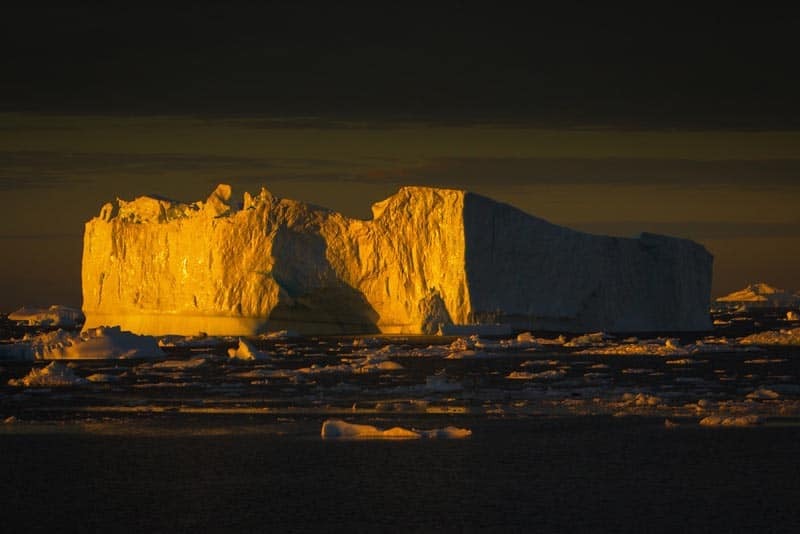 Sometimes icebergs are very porous as if they have been melting at an extreme speed. Something tells me this iceberg will be rolling over soon. As we made our way south, the ice became less dense, but there were still mounds of ice littering the ocean. At sunset the water was always calm offering incredible reflections. My favourite time of day was sunset. We had never witnessed so many shades of blue at once. Even Antarctica didn't have this beautiful of ice. 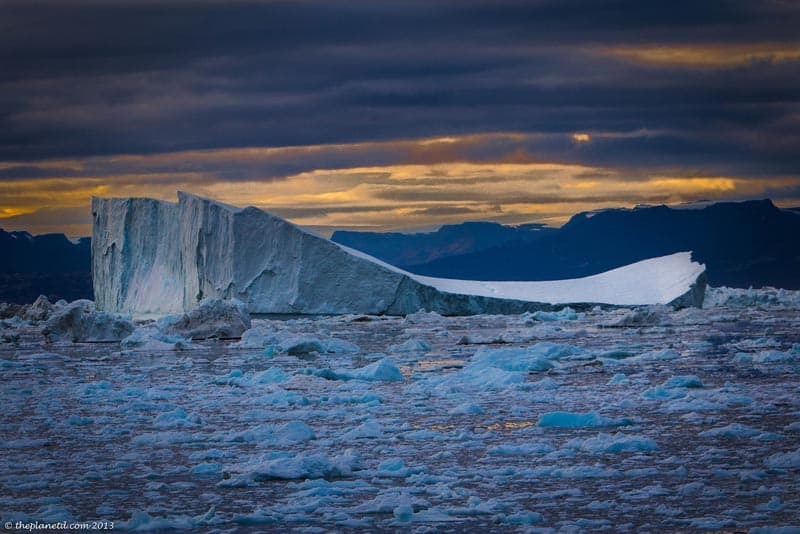 We thought that we would only see ice during the first half of our journey through Greenland, but it showed up throughout our voyage from beginning to end. This ice looks more like a sea cliff off the coast of a country, but it was simply a giant iceberg floating in a bay. 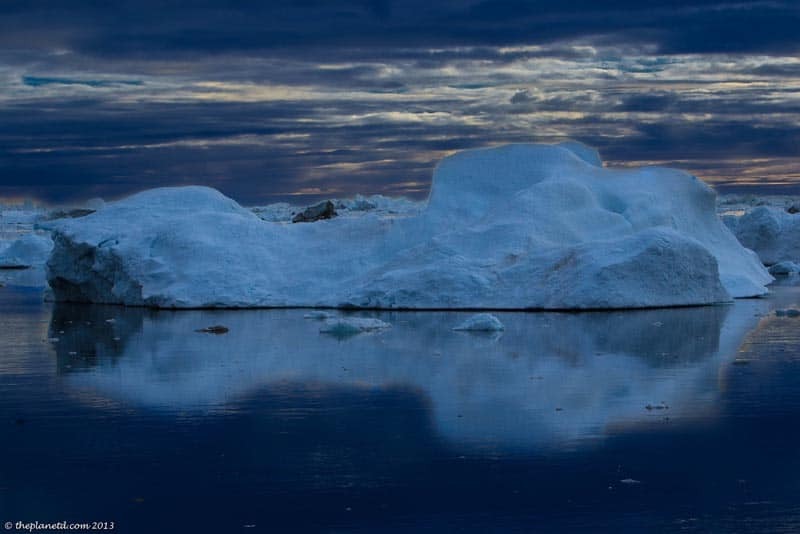 One last look at Arctic Ice…. 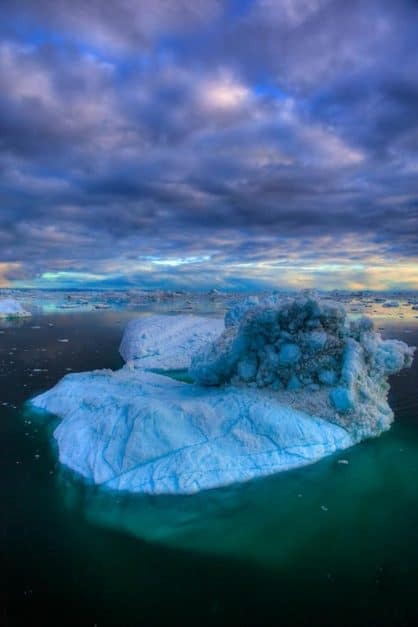 53 Responses to "23 Epic Photos of Remarkable Arctic Ice"
These photos are absolutely stunning. I am in love with learning, so I appreciated all of the cool facts that were included. Who knew! It makes the photos that much more interesting. Wow, this is stunningly beautiful. This is a part of the world that few people get to see. Thank you Maggi. 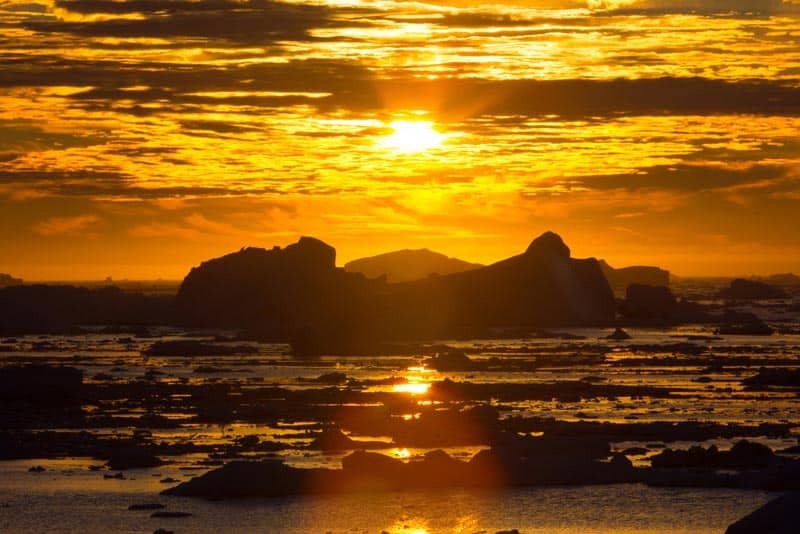 We feel very lucky to have been able to witness the ice of Greenland. WOW! Those are some stunning photos! It makes me want to get a kayak and go explore the Alaskan coast. Thanks for sharing. Thanks Jeff. Do you live in Alaska? Gorgeous, gorgeous, gorgeous! Now that we’ve spent so much time exploring the Arctic and fallen in love with it, we are on a mission to get to Greenland. Hopefully 2014! You would love Greenland Jennifer. It’s true, it’s just up your alley since you have travelled so extensively in the rest of the Arctic. 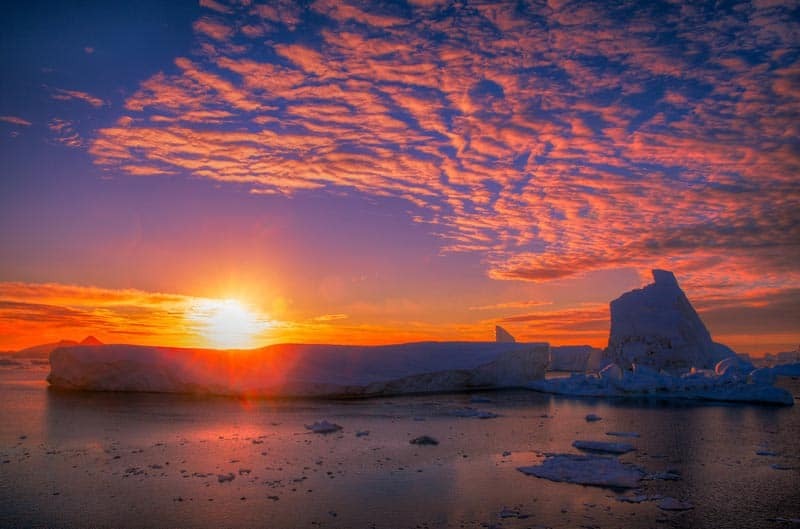 Thank you so much and glad that we could add Greenland to the your list of future travel places you will love it! Beautiful shots! I love the color and texture! Wow amazing pictures.I would love to visit these places atleast once. The ways you are maintain your blog . it was awesome I love it. Thanks keep posting like this..
Really gorgeous photos! I loved seeing icebergs in Antarctica, so I’m sure I’d love the arctic too! The rare time the oft overused term epic is completely justified. Awesome pics ! Well, what to say, whaoooooooooo man, what an experience that must have been, probably one of those life changing experience, to see what nature is capable of, the colors and shapes, just amazing. How about temperatures? Is it very difficult to cope? Or is what you’re seeing so overwhelming that literally makes you forget about the cold? Truly epic! I can stare at this site the whole day. Is this what they call the “birthing” place of glaciers? Awesome! 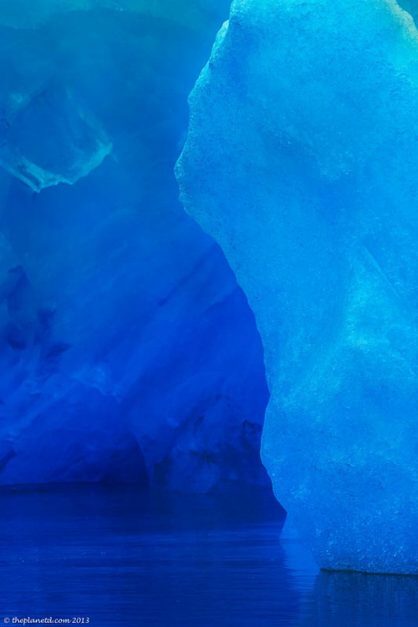 These are all absolutely stunning images, though I think that the one subtitled “The blue of the ice is almost blinding” is the most breathtaking of the lot! Amazing pictures! You are truly blessed to be able to witness it all behind your own eyes. Thank you for sharing! Glad you liked it and yes, it’s a great destination to add to your travel list. Awe inspiring images guys. I’m envious of your Arctic exploration. Although I love the beach I would love to see these icy views with my own eyes. I hear you, we love the beach, but there is something mesmerizing about incredible ice. It’s always weird how giant floating ice cubes end up making for some spectacular photography, but that’s just how it goes. The sunset photos are my favorites, I think. Haha so true. Take photos of ice in a little pond and it’s not quite so magnificent. Absolutely jaw-dropping. What a marvel of nature that I’ve never experienced. One day I’ll get to the arctic, but thank you for transporting me there with these stellar photos! You are very welcome Ryan, thanks for stopping by to have a look. They’re all quite epic, though my favorite is the second one down labelled “Sunrise in the Artic”, I just love that dark orange w/ the subtle blues in the ice. Thanks Devlin. We love that one too! Looks like a stunning place! These photos are amazing! I didn’t realize how pretty ice could be. Thanks for sharing these stunning photos but its all about my Allah. Wow! These are truly beautiful. This really looks like a fun, albeit cold, adventure. Just showed these photos to my husband and told him we have to go! The many colors and facets of Arctic Ice. I super like it. Great pictures man , really want to go there . Thanks for sharing this picture. Absolutely stunning pictures….. I never considered visiting Greenland. Always thought it would be way to cold for me.. But looking at these pictures seriously make me wanna go there! Great work and keep posting amazing pictures! Thanks for sharing these stunning photos! They also have a kind of eeriness to them– what was the atmosphere like as you were cruising through the ice? Is it just dead quiet except for the sounds of the ship? I’ve never been, but I’ve always imagined the arctic to be the place where you would feel the most isolated from the rest of the world. I would have never thought about making a photo essay with shots of ice… but with photos like these… stunning you guys! Can’t wait to go to the Arctic now! Wow! These pictures are stunning! They truly capture the beauty that is hidden in the ice. It must have been pretty damn cold out. Thanks for sharing your experiences, one day I will check out the secrets the artic holds. These photos are amazing! I didn’t realize how pretty ice could be. The close-ups are just amazing! The icebergs look like massive blocks when viewed from a distance, but getting close you can really see how delicate they actually are and how much detail they have! Fantastic photos! So true, They look like dots in the sea from afar, but when you get up close they are gigantic and yes, the details in them are striking. The water creates the most amazing patterns in the ancient ice.